The Great White Woobie, a larger Pomeranian, was the third dog to grace us with his presence. We already had Jackyl and Chewy Lewis when we brought home this little fluffball. He was in such bad need of a grooming when we got him, that we didn’t even know he was a white dog with tan spots, we thought he was brown. Not that it mattered much to us. But he was a cutie! His brother’s didn’t much care for him at first. The Man of the House blamed it on his girlishness. I think they were content just the two of them. But oh, was he a cutie. 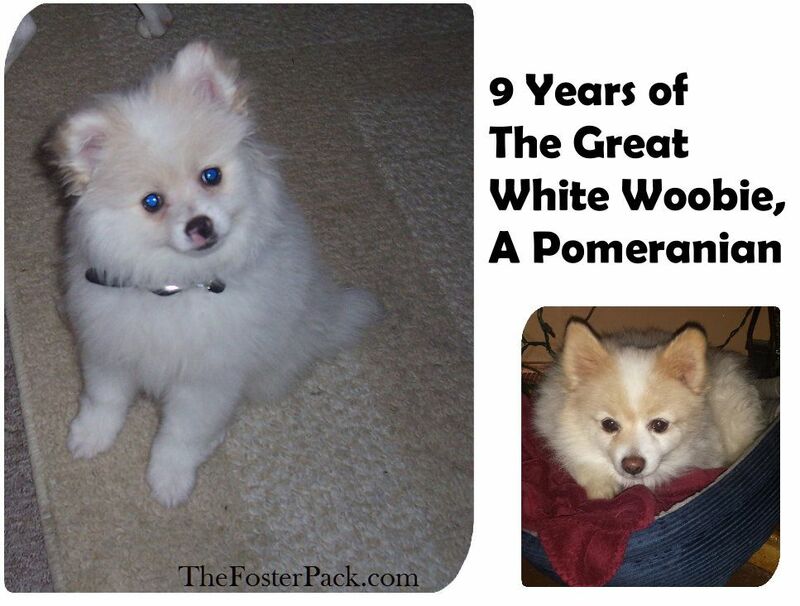 The Great White Woobie: The First Year, Pomeranian Puppy-hood. How his name changed from Great White, to Woobie. His favorite stuffy became known as his Woobie…. His little pink and black nose. His first hike. 6 months old. His brother’s broke his ear. Crate training. He likes his little box, but won’t allow us to put any bedding in it. 10 Months, His ear finally healed. Waiting his turn for belly rubs. His hideout from the world. Occasionally his ear still falls over. His favorite game of tug. As the most anti-social dog that we’ve ever dealt with, he’s the one I probably have the least amount of pictures of. I don’t know if that’s a Pomeranian thing, or just his own personality. Now that he’s nine years old, he basically spends most of his day either under my desk, he likes me to rub him with my feet while I work. Or in his crate, hiding out from the world. He’s also the dog that seems to hide his age the best. Again, not sure if that’s a Pomeranian trait, or because he’s white. What a pretty boy Pomeranian. Nap time. One of his favorite times of day. He loves to hold Jackyl down and clean his teeth. What a good brother he is. Mobbing Sister, with his brothers, Jackyl and Chewy Lewis. Woobie is upset about getting a haircut. But that’s what happens when little Pomeranians play in the burr bushes. He looks like a little lamb instead of a Pomeranian. We walked around singing “Mary, had a little lamb” for about a weeks after his haircut. This is why Pomeranians need haircuts. They like to play in the bushes. One of his favorite toys. We save up the empties, and hand them out when we have enough. But only when they’re being supervised. Waiting for the grass to grow. It took quite a while after we finished construction. Time for another haircut. I think this one was because of tree sap. He sure likes to get messy. Two year old Pomeranian. Licking his chompers. And not looking happy about it. Watching the snow with Sister. Growing his winter coat in. One of his favorite places to be when it’s hot out, in a window sill with a nice breeze. Playing outside with his big brother, Jackyl. Woobie, and Jackyl hanging with Sister. 3 year old Pomeranian. He almost looks happy. Almost. The Glare. It’s always that look if you peek into his crate. Cuddling with daddy, during nap time. 4 Year old Pomeranian. He didn’t want his picture taken. Hoarding toys. I think one of my little nieces was shoving them in there with him. Meeting a new brother, Ozzy, a 7 year old Min Pin. 5 year old Pomeranian. He loves to sleep on a chair by the window. Stretching, he’s finally decided to come out of his crate and grace us with his presence. 6 year old Pomeranian. Getting his face washed by his brother Jackyl. They love to groom each other. Seven year old Pomeranian. With a bad haircut. He still hasn’t learned to stay out of burrs and sap. Eight Years old. Hiding from the world under Sister’s Desk. Lounging on the couch watching the other dogs play. Nine year old Pomeranian. But not showing his age at all. He still looks young. We’ve finally got a foster dog that Woobie really digs. Another Pomeranian who loves the same things. Hiding in their crates. Porch sitting, but only in cooler weather, and laying under desks. Lip Licking in Dogs, What does it mean?